You are here: Home / Ethnic Groups / The People of Sumatra / Who are the Pegagan? 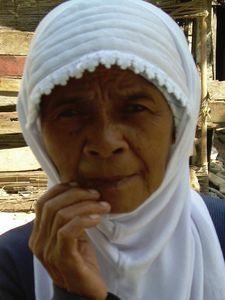 The Pegagan are a people group who live along the downstream section of the Ogan River in the Ogan Ilir Regency in South Sumatra. Neighboring peoples call the Pegagan dialect “Sue Sue.” The Pegagan are known for a local dish, Pindang Pegagan, which is freshwater fish cooked in a thin sauce. In their area, the Pegagan live alongside the Palembang, Meranjat (also called “Penesak”), Rambang and Kayu Agung peoples. The Pegagan dialect is part of the Musi language group which also includes the Musi, Rawas, and Penesak languages. The Pegagan, like other inhabitants of South Sumatra, are generally friendly, easy to get along with and quite open. People who move into their area find it easy to adapt to living with Pegagan neighbors. Rice farming in the Pegagan area is unique in that wet rice cultivation is practiced. The wet rice fields consist of three parts: dikes that separate the fields into sections, areas with shallow water, and areas with deep water. On average, rice can be planted in the fields for two growing seasons, after which other crops are rotated in for a season. At the start of dry season, farmers begin to plant wet rice fields. Later in the year they fish from ponds that form in those same fields. Rice farming and fishing are two sustaining industries for most of the community in Pemulutan District of Ogan Ilir Regency. The many rice fields meet the daily needs of the residents of the surrounding areas for the entire year. During rainy season, the fields normally become small ponds and lakes. The community is free to catch the many species of freshwater fish that can be found in the flooded fields. With the arrival of dry season, the water begins to recede and the fields can be used for rice cultivation again. Rice farming is the mainstay of the Pegagan people’s livelihood. They also raise fish in rivers, produce cloth embroidered with gold and silver thread, and raise small livestock in order to supplement their income. The fields that they own are usually inherited and cannot be enlarged. One local celebration, Ningku, is attended by unmarried men and women following Lebaran, the feast marking the end of the Ramadan month of fasting. Almost all young Pegagan men and women leave their home area to look for work in other places, but will return home to visit at Lebaran. Ningku is a chance for unmarried men and women to get to know one another. The young people parade in their best clothing and then go boating on the river that passes through their area. All Pegagan people are Muslims. In many places, Islam is intertwined with traditional customs. Many mosques in the Pegagan area are quite large and the Pegagan people are very active in religious devotion. One Pegagan district, Indralaya, is slated to become a buffer zone for the capital city of Palembang. Because of this, the area is beginning to develop. The biggest need of the Pegagan is the ability to leverage the advantages of this development for their benefit. Training in entrepreneurship is an important need.